The most limiting nutrient for dairy cows is energy. 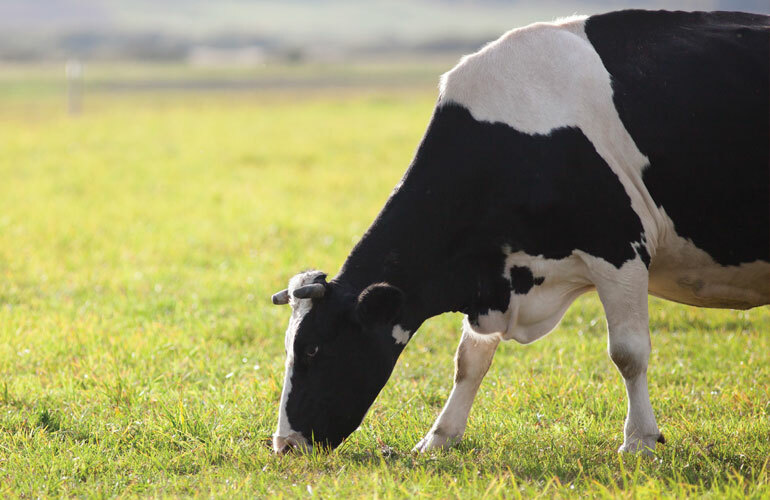 Balancing and feeding diets that can keep the rumen at a consistent level of energy production – especially for high milk producers – can be a challenge. No matter if rations are being fed to the fresh cow, the transition cow, cows in late lactation or heifers, all energy created by rumen microbes must have sufficient amounts of carbohydrates included in the diet. To make energy metabolism even more complicated, the weather, hot and cold, can raise energy requirements for cows and heifers dramatically. Ruminant nutrition requires that rumens have substantial levels of forage to remain healthy and productive. Forages, however, are the least digestible of the feedstuffs we feed our cows. The cellulose in forages is seldom completely fermented by rumen microbes. The fermentation process produces the precursors to glucose synthesis, which is the primary source of energy in cows. When glucose synthesis is reduced, so is the cow’s overall metabolism, limiting growth in the case of young calves or milk production in older cows. The introduction of feedstuffs such as grains or other commodity byproducts into diets provide starches and sugars that are more easily fermented by rumen microbes than cellulosic fiber from forages. For cows in late lactation, producing lower levels of milk, or heifers and dry cows, diets heavy on forages with less starch and sugar tend to provide adequate energy levels for maintenance, growth and production. However, for cows with increased milk yields, the need to raise energy intakes to support the additional production requires higher feed intakes or greater energy density in the diet. As is often the case, forages that must be included in the diet will prevent energy density from being increased. An effective solution to increasing energy density in ruminant diets is to add fat to the rations. Unlike in the stomachs of monogastrics where fat is converted to glucose, rumen microbes do only a minimal job of fermenting fat molecules. In the rumen, free fatty acids undergo a biological process called biohydrogenation, which results in all fats becoming saturated while still in the rumen and not converting them to volatile fatty acids. Saturated fats are less digestible in the small intestine. Even if polyunsaturated or monounsaturated fats are fed to cows, much of it is converted to saturated fats before leaving the rumen. In addition, moderate amounts of any fat will coat fiber particles to the extent that rumen microbes cannot ferment the fiber. Once fiber fermentation is compromised, energy synthesis is reduced as well as butterfat production. Even though, in theory, fats are the most energy-dense of all feeds, for them to provide metabolizable energy, they must be fed in a form that bypasses the rumen and proceeds directly to the small intestine. Rumen-protected (or rumen bypass) fats are commercially manufactured fat products of varying fat content and fatty-acid profiles that allow increased energy densities in all ruminant diets. RP fats enable nutritionists to increase energy density in dairy cow diets without having to add more starch or sugar. Adding a starch source to raise energy intakes often requires several pounds of grain, which may result in acidosis. RP fats replace the need for excessive levels of grains and commodity byproducts. Rumen-protected fats offer the option to dairy farmers of adding extra energy to a diet to compensate for low energy corn silages or other roughage. Adding a pound of RP fat to a dairy cow diet will provide enough energy to support an extra half-gallon of milk per day. In the case of heifers or dry cows, RP fat will enable cows to maintain body condition during excessively cold periods where more energy is needed for maintenance. RP fats should be regarded as a tool with which to adjust energy density in diets depending on the other feedstuffs that are available for rations. In many cases, it may not be necessary to add RP fats in diets all year long – instead add fats only when conditions require the addition of a more energy dense diet to compensate for feedstuff quality or adverse weather conditions that cause cows to require more energy. The commercially available rumen-protected fat products on the market today are primarily combinations of various unsaturated fatty acids that have various coatings on them to prevent rumen microbes from converting them to saturated fats. Research has shown that mono- and polyunsaturated fats are more bioavailable once absorbed through the small intestine. Unsaturated fats increase milk production and feed efficiency in high producing dairy cows. Feeding rumen-protected fats is also appropriate for dry cows, heifer and calves in excessively hot or cold weather conditions that increase maintenance requirements. Along with improving the immediate energy status and alleviating negative energy status during early lactation, the RP fats have also been found to improve reproductive function in early lactation. Several polyunsaturated fats are instrumental in ovary health and follicular development. Even if cows may not need additional dietary energy for body condition or milk production, feeding a properly formulated RP to dry cows has been shown to improve conception rates. In dairy herds that are managed with more than one production group, addition of RP fats in the early lactation or high production groups will give the greatest benefits in production and feed conversion efficiency. Depending on the energy value of feedstuffs, lower producing groups may or may not benefit from adding RP fats to the diet. The two most commonly used RP fat products today are: 1) fats that are combined with calcium to form a calcium salt that remains inert in the rumen and 2) fats that are coated with a polymer coating that resists rumen degradation. Both technologies enable the fat to bypass the rumen and are absorbed in the small intestine where the various fatty acids are metabolized. RP fat manufacturers each have their own recipe of various fatty acids in the products. Dairy producers and nutritionists should study the research and product claims of the various products on the market and choose the product that will give the most desired result. In some cases fat combinations will favor milk production while others will favor milk component or improving body condition. RP products are expensive but their efficacy is usually worth the investment.